...on a GMS Aftershock Nitro drag chassis. It's a Pegasus "SS" body, part number PGH4001. I think Horizon carries them. Wow now thats a kick azz body ! vary nice bro! How fast? Top speep? Brand new, never run, built for a friend. Very nice package. The second image seems to capture better the true Chevy blue than the first. And the racing stripes are spot-on. I'd often thought a nostalgia class in rc drag racing might be worthwhile. Maybe not so much what E.T. 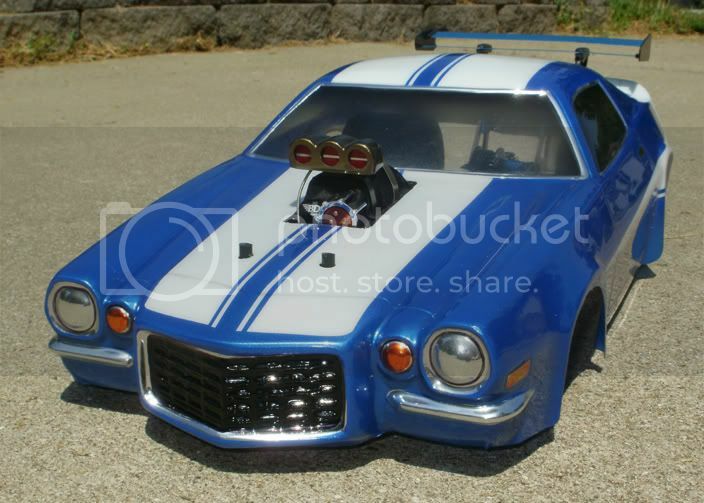 and Speed a carproduces; but to capture the essence of drag racing the way it used to be.Both as 1:1 and scale 1/10 rc. Hope you keep cranking out the classics for years to come. AHR... Your avatar pic is Jim Busby's twin DOHC dragster?... awesome machine!!! Almost 40 years ago. Unreal. Oh ! Kip, aka Slash, bought a 1:1 dragster, did you know that? Dear Kip... I hate you right now.